RIGHT SIDE OF THE TRACK Huhtamaki has improved its shipping program by moving more shipments from the road to the rails. Huhtamaki is a maker of packaging goods used in the food service and retail industries. You might know it as Chinet, the brand of premium disposable tableware, but the company makes a full range of food-service and consumer-goods packaging. Here’s how increasing intermodal became a key component to its transportation strategy. 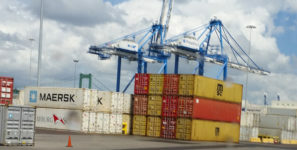 Global Trade: When did Huhtamaki begin to rely more heavily on intermodal as part of its transportation program? Scott Stuckenschneider: We have shipped via intermodal for many years, but we did so primarily in terms of replenishment. When we hit the tightening [trucking] capacity, we began to investigate how we can take that beyond just a replenishment of our distribution points, directly to our customer. Late 2013 is when we made the decision that we were going to begin shipping via intermodal to our customers. Which types of customers are best suited to your intermodal program? Customers that have consistent work patterns, minimal numbers of ship-to. So you have specific lanes that you are going to and also customers who place orders and then don’t change them two days before they are due. Do you base your intermodal decisions more on mileage or different lanes where an intermodal solution may be more convenient? It’s really more the latter than the former. East to west is easier to navigate for intermodal than north to south, and usually for something 750 miles or more it is more cost competitive to use intermodal than over the road. Usually something less than 750 miles, we have not found to be that advantageous to use intermodal. Can you give some insight as to how you set up and manage your intermodal? When we contract our lanes, we will tell a carrier or a provider how many times we will ship between point A and point B in a given week, month or day. Sometimes you are shipping one load every day, sometimes you’re shipping two loads a week, sometimes you’re shipping four loads a month, so if a carrier knows that they can count on you for that, you can many times get better rates by contracting that lane as opposed to just what we call “dialing for diesels” and just getting trucks that are on spot market. Did you have any reservations about moving more from the road to the rail? Absolutely. There are always reservations because on-time delivery is very important to our customers, so we had to be sure that service levels would not suffer. I think the consistency and performance of intermodal carriers has certainly changed over the years, and it has become more consistent and more reliable to deliver at appointed times. And that’s very important to our customer base. How did your third-party logistics provider, Transplace, help you throughout this process? I would say Transplace helped us primarily with identification of what I would consider to be solid intermodal lanes. It offered savings to over-the-road carriers. They also exposed us to a one-stop shop, if you will—to a broad array of intermodal carriers. Will you be moving more of your shipping program into intermodal as a nationwide driver shortage rolls on? I think that answer to that is we will continue to look for ways to expand our intermodal usage. Do you feel as though your customer base is pretty well set and there’s not a great need to look for ways to expand your intermodal program? Absolutely not. I think that as the intermodal network continues to improve, we have to continue to explore what of our customer base might be suitable for using intermodal. I think that is a continuous evaluation that we have to go through. You go through it one time and expect it to be over. We [reevaluated] in 2013 for 2014 and I can assure you we’re doing it again in 2014 and looking for new opportunities that either become new business for us or new lane opportunities for us in 2015 that we didn’t use intermodal in 2014. What is your advice for smaller shippers with less experience who may be relying 100 percent on trucking for moving products domestically? I would say that mode of transportation is very important to all shippers and the successful shipper is the one who investigates and capitalizes on the lowest-cost mode. Many times that will be intermodal, and if they’re not looking at that, they are going to miss out on that lowest-cost opportunity. Was your increased use of intermodal less about consistent on-time performance and more about saving time and money? Scott Stuckenschneider is vice president of Supply Chain at Huhtamaki. * This interview has been edited and condensed for print.